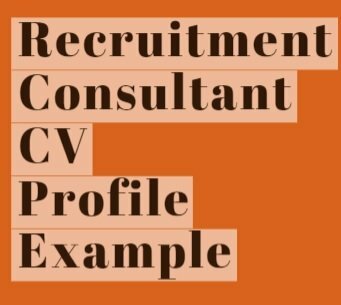 If you are looking to apply for a role as a Recruitment Consultant and need to update your personal profile within your CV first then it is keen to break down the skills that you have and what you think from reading the job advert or job description that you know what the employer would be most interested in. Remember that the type of role that you are applying for also demands that you have an outgoing personality and that you are not afraid of rejection from making cold calls to potential employers seeing if you are able to help them with their recruitment. I have a proven track record in sales and customer services and feel that over the years I have improved my communication skills and I enjoy communicating with different types of people and projects. I am dedicated to my work and enjoy dealing with people and being able to help them and make a difference to their career. I enjoy working to targets and get a real sense of achievement out of meeting and breaking my targets. I feel that I have gained enough experience to know what the correct questions are to ask employers when hoping to deal with their recruitment issues and feel that I have adapted my approach depending on the client and type of business. I have a very self motivated attitude and I am enthusiastic towards my work and professional career. I am very organized and thorough and have had some experience in looking for current job vacancies and cold calling companies from that information. I can write good job adverts and have a good interview technique which I use daily and I like to find out everything I can about the job role and company I am dealing with as well as getting to know my candidates and their skills well.